You are here: Home / Tega Cay News / Marketing is for The Dogs! Marketing is for The Dogs! Marketing a small local business takes a lot of work. There are many bumps in the road when trying to market your business that limits what you can do. Michelle Shirley started a pet sitting business last year called the Petnanny. She has tried many things to get her name out. Real estate type signs certainly do the trick but where do you put the signs? Tega Cay like many cities now days have sign restrictions that limit where you can put signs and when unless your a politician running for office. Michelle and her husband Scott initial bought a pile of real estate signs. They religiously put out signs every weekend and took them down before Monday. They placed signs in and around the Baxter, Fort Mill, and Tega Cay area. Slowly they began seeing their sign inventory dwindle. The signs were being taken by various people. Their guess was city staff or just angered citizens who don’t like signs. Finally Michelle was able to make a reciprocal ad arrangement with the Sunoco K Won Mart at the corner of Highway 160 and Gold Hill Road. The picture above is the sign that now sits daily at the convenience store with a fair amount of traffic passing by daily. Michelle and Scott say thanks to the K Won Mart for helping out. Michelle’s pet sitting business called the Petnanny has been doing very well. Michelle says the best marketing investment so far has been the signs on Michelle’s Hummer 3 but the real estate signs are definitely an important part of her marketing success. Michelle is an experienced pet sitter and of course a pet lover. 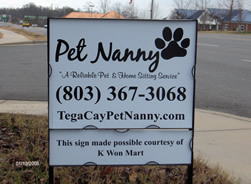 For more information visit her website at http://www.tegacaypetnanny.com/. I am sad to say someone has actually stolen Michelle’s Pet Nanny sign.